If you have a small family or run a small delivery business, the Caravan offers an inexpensive way to get around town. The SXT model comes nicely equipped and offers a V6 engine. 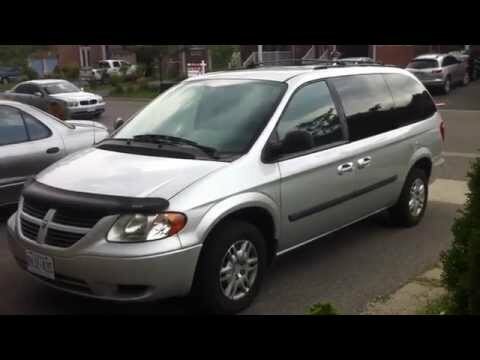 I think that the Dodge caravan would be great for someone with multiple children. But, I am the only child. It is an older model that does not have Bluetooth or GPS, and it is not very stylish in my opinion. It does have a decent amount of room and is a 6-7 passenger vehicle. It has a decent trunk, nothing too big or small. It has floor storage, too (you can open a latch on the floor and store things under there). It does not burn as much gas as a truck would, and you still get pretty good storage. Although these features are nice, I wouldn't buy one with my own money. Also, I have never been fond of minivans or vans, anyway. It is about preference in my case. Every vehicle is not for everyone. If you have several children, this is for you. With all the seating, (depending on how many children you have) your kids can have their friends ride to their destination with them. If you are always lugging around a lot of stuff and need the storage without spending a whole lot on gas, this is for you. It is not super economical, but it gets you where you need to go. However, if you are looking for something stylish and fun, this is not for you. It is the exact opposite. It is not to say it is ugly, but it is not something someone would usually take pictures of proudly. If you want more modern technology, this vehicle is not at all for you. It does not even have auxiliary jack. Enough said. Great vehicle for the entire family. The seats are very comfortable, I have had a Honda Odyssey in the past and it wasn't as comfortable for the price you pay for it. The van has a great stereo/cd player with great speakers. The seats come out very easily and are easy to put back in. The driver's seat is ideal for driving long distance. There are adapter outlets throughout as well as cup holders. This van is cheap enough to convert into a handicap van if need be. Hence, if you eventually sell it as a handicap van, you can get a good amount of money for it. The van comes equipped with rear defrost and wiper. The van is great on gas compared to other minivans of the same size. For the year of the van we have been fortunate not to have to put a lot of money into it. Basically just maintenance work. There are very few negatives about the van. On issue is the undercarriage gets rusty quite easily. For the most part, this is a great van especially for the year. I'd love for the tire pressure to stay at a normal pressure. My Dodge caravan was bought as a handicap van for use for my husband. Originally, we thought it had a electric lift, but it does not. The van has had some minor mechanical problems such as brakes, power steering and every day wear and tear. Keeping the tire pressure at a correct level has been difficult. We took it on an 1800 mile trip and other than the air pressure and the power steering making noises it was a pleasant trip. The ride in the front seats are fairly comfortable, however, the back seats are not. Heating and cooling in front is ok but for rear passengers it is not. Since it is an older model we expected wind and road noises but the road noises are louder than we expected. We have less than 75000 miles on the van and we expect it to run for at least that many more. SUNSET VANS IS RECALLING 169 MY 2005-2007 ECONOLINE, G SERIES AND SPRINTER TRUCKS BUILT ON DODGE, FORD AND CHEVROLET CHASSIS AND EQUIPPED WITH RICON PLATFORM STYLE WHEELCHAIR LIFTS. THESE LIFTS FAIL TO COMPLY WITH THE REQUIREMENTS OF FEDERAL MOTOR VEHICLE SAFETY STANDARD NO. 403, PLATFORM LIFT SYSTEM ACCESSIBLE FOR MOTOR VEHICLES. THE ANTI-STOW INTERLOCK MAY NOT DETECT THE PRESENCE OF A WHEELCHAIR OR MOBILITY AID USER. THE PRESSURE SENSING SWITCH THAT DETECTS THE PRESENCE OF WEIGHT ON THE PLATFORM WAS NOT ADJUSTED TO THE NECESSARY SENSITIVITY LEVEL. THE LIFT COULD STOW EVEN THOUGH SOMEONE OR SOMETHING IS STILL ON THE LIFT. SUNSET VANS IS WORKING WITH RICON TO CORRECT THE WHEELCHAIR LIFTS FREE OF CHARGE (PLEASE SEE 07E097). OWNERS MAY CONTACT RICON AT 1-818-267-3000 OR SUNSET VANS AT 1-888-280-8267.